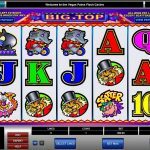 Big Top is a fast paced video slot game from Microgaming. This is a circus themed game that takes us back to our childhood. So, go see the elephant riding a tiny bicycle, the magician tiger and of course the funny clowns. Earn some cash while you are having fun that is exactly what this slot has prepared for you. The symbols are very colorful and most of them are theme related. Straight to the point, Big Top is not packed with special features. We have only a wild symbol and a scatter which brings some excitement to the base game but that is all. The clown is the wild symbol and it substitutes for every other symbol except for the scatter to complete a winning line, but it does not offer a multiplier. The scatter symbol is the monkey and it offers scatter payouts, and it does not trigger any special features. The only good thing here is that the scatter pays no matter where it appears on the reels. 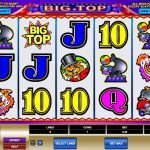 Microgaming wanted to create a game as simple as possible when they came up with Big Top. The truth is, many times we are looking exactly a game like this one. The game play is straightforward and your only focus is on the game itself. You will be surprised how popular these kinds of slots are. The thing is, we can get overwhelmed with high variance slots where you can lose all your money in the nick of time, then we get overwhelmed with games that offer complex special features but then again we never manage to trigger them while we are playing. For that reason we need games like this, where you can relax and just enjoy the simplicity this slot has to offer. Want something different? 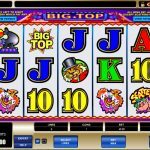 consider playing Big Kahuna Snakes & Ladders a 5 reel slot by MicroGaming.